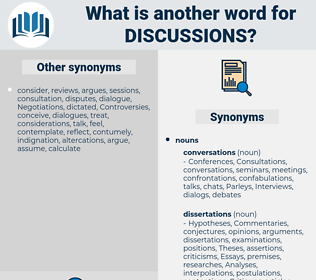 What is another word for discussions? communications, confrontations, findings, considered, Considering, investigations, considers, disagreements, consider, decisions, conciliations, contributions, occasions, descriptions, resolutions, Telecommunications, opinions, institutions, actions, quarrels, transactions, interventions, observations, Negotiations, currently, Examined, connections, briefings, submissions, conflicts, issues, matters, expositions, examines, affairs, workings, contents, roundtables, reviewed, words, symposiums, location, comments, recognition, explorations, discrepancies, newsgroups, differences, chairperson, agenda, holding, examine, course, operations, relations, subjects, Hostilities, Interviewing, reviews, commitments, Studies, documents, stakeholders, details, reviewing, jobs, applications, factors, grounds, searching, perspectives, circumstances, squabbles, agreements, outcomes, Inquiries, contacts, concerns, interests, entrepreneurs, minutes, speeches, work, sittings, gatherings, participants, Exercises, delegations, Analytics, reading, readings, contexts, summits, insights, reasons, Conferences, reflexions, thoughts, leaders, things, Records, analyzes, envisages, tours, terms, elections, sources, reflexiones, proposals, Opportunities, reports, maintains, channels, links, trade-ins, Activities, candidates, sharing, encounters, headquarters, fields, trade-offs, Attitudes, Workshops, attendees, seeking, Arising, points, representatives, works, Measures, Pleadings, threads, Ideas, item, items, demarches, acts, rethinking, PROSPECTS, experiences, ways, assessment, assessments, Efforts, Wars, Maintaining, clashes, remarks, imbalances, projects, tables, courts, rulings, estimates, processes, maintenance, groups, times, results, battles, Queries, Tests, means, themes, aspects, discusses, tanks, tasks, Appointments, elements, assignments, Languages, contractors, swaps, responses, officials, treatment, treatments, citizens, Assemblies, developments, experts, Areas, ministers, values, methods, practices, therapies, plans, expressed, sides, officers, views, Lives, changes, rows, cases, desks, framework, exports, actors, arrangements, Bodies, initiatives, Rights, visits, Tracks, treaty, gaps, VOTES, partners, flows, calls, members, materials, players, books, seven, ties, problems, deals, place, _, bureau, departments, Parties. considers, covers, Addresses, trades, exchanges, flows, deals. discuss, discusses, debate, debates, Discussed, conversation, conversations, focus, dialogue. 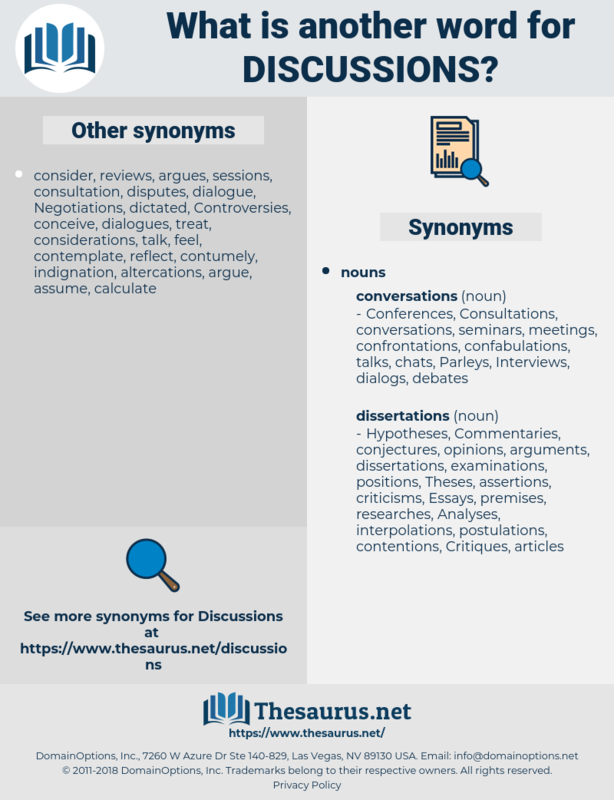 Consultations, discourses, questions, topics, contentions, interactions, conclusions, presentations, examination, examinations, reflections, Controversies, disputes, seminars, dealings, dialogs, speaking, arguments, Forums, procedures, Hearings, Lectures, interchanges, panels, Addresses, papers, struggles, trades, exchanges, trials, speakers, EXAMS, debates, Discussed, dialogue. Now, gentlemen, these are novel discussions in a Court of Justice, within the United States of America. The most trivial things served as a motive for very long discussions. day game, dawson, djinny, djinni, digoxin, diocesan, dasheen, dietician, disjoin, da gamma, dagame, deskman, discina, dozen, dissuasion, dysomia, dogma, disunion, decennium, doeskin, dot-com, diegueno, dudgeon, dagon, dysosmia, dioecian, Duke Wayne, dacninae, daoism, deign, diazonium, design, dodecagon, dicksonia, dadaism, dkm, dusicyon, disown, dizen, decagon, dagan, dioxin, disney, deacon, Day Jessamine, decuma, dutchman, dismay, dexone, dot com, Dutch Guiana, deism, dodgson, daikon, daisy-chain, dijon, deaccession, dodgem, daisy chain, decision, dig in.